In our previous post, Telecommuting Today: A Pulse Check, we posted some findings from our 2012 Telework Survey from those that consider themselves Teleworkers, err, we mean people who “Work at Home”. Today we look a little deeper to see what Managers of teleworkers, who also telework themselves, are thinking about telework – excuse me – “remote work”. “Work at Home” is used most by professionals, who, well, work from home. 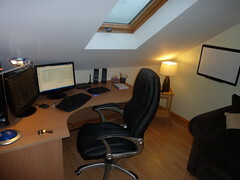 “Work at Home”, followed by “Remote Working”, was the phrased used most by managers who also telework themselves. Want to know our own insights? Perhaps we’ve finally reached a point where labels just aren’t necessary. People are working, plain and simple. Perhaps the time is now to change “alternative workstyle enthusiast” to “work enthusiast”. Our other major insight? Try as we might, the term “telework” is just not sticking. Managers who also telework are less likely to work in a public place. Online meetings are important, but could be improved. Not surprisingly, 100% of the managers that responded said they need to meet online with teams. What is surprising is that while most rank their own methods satisfactory, scoring them an “8” or “9” out of 10, over 92% would make their online connections easier/better if they could. As a manager, 100% were satisfied with how they communicate with teleworkers, communicating primarily via email, VoIP, teleconferencing, and document sharing. Yet, 50% felt disconnected with their staff at times, citing “it’s not always easy to get a hold of them”. This leads nicely to the next point we learned. Texting tops the technology list for managers who telework. We have to admit, this one surprised us… until we learned why managers felt disconnected from staff…”it’s not always easy to get a hold of them”. We asked respondents to rank different technologies by how often they use them. What is the technology used most of the time from teleworking? IM’ing, VoIP, and web-based databases. In that order. Email is still the most widely used web-service. Not surprising, email was the top-ranked web-based service used most of the time. 100% use email most of the time. What was surprising? LinkedIn was the second most used web-based service when working from home at 40%. Now THAT warrants some follow-up questions. GoToMeeting and Dropbox followed closely. Managers who also telework are challenged most by feelings of isolation. When asked what their biggest challenge was when working from home, the managers most often cited “feelings of isolation”, whereas in our previous blog we learned that teleworkers tend to be challenged by “physical distractions” most often. Of course, thinking about it – it does make sense. Managers tend to be “people” persons. Feeling isolated isn’t that big of a challenge. We wanted to find out how big a challenge that “feeling of isolation” was, so we asked respondents to rank the challenge on a scale of 1-10. (10 = a huge challenge, 1 = not a challenge at all. 29% of Managers ranked isolation highly (8-10 out of 10). Managers who telework are people who need people. Compared to working in a traditional office environment, managers who telework miss being around other people the most, and miss people more than other teleworkers. 43% miss this social aspect of work, compared to 23% of teleworkers. Psst…Mom was right. When you can’t say anything nice…don’t say anything at all. Managers aren’t likely to hear about the challenges of their teleworkers. 82% said they do not hear complaints from staff in regards to their telework conditions. We at Duncan+Coleverria have a theory on this: Don’t rock the boat and capsize a good thing. This entry was posted in General Musings and tagged business challenges, flipside workspace, future of work, remote worker, work from home, Work–life balance. Bookmark the permalink.